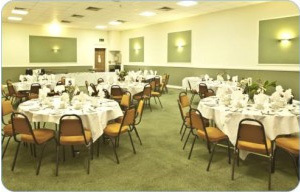 This is our main function room and is suitable for weddings, parties and conferences. This room is licensed to carry out marriage ceremonies for up to 150 guests. 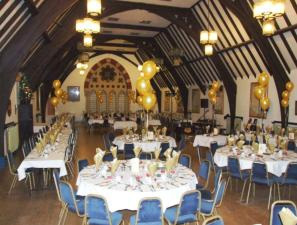 The room can comfortably seat 150 persons for a sit down meal using round tables and oblong tables with a large dance floor and if the room is being booked for a wedding there is still ample room for extra evening guests. The room can accommodate 210 persons for a more informal party. For Conferences the room can hold 300 delegates theatre style. The room is situated on the ground floor and is adjacent to the reception lounge and bar. The room is fully air conditioned. The Wisby room is ideal for the smaller wedding, party or conference. This room is licensed to carry out marriage ceremonies for up to 60 guests. The room can comfortably seat 70 persons for a sit down meal using round tables with a dance floor or for a more informal party can hold 80 persons. For Conferences the room can hold 150 delegates theatre style. The Wisby room is situated on the ground floor and has an air cooling system. 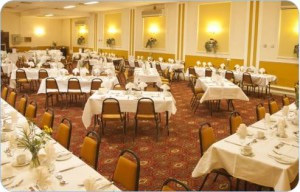 The Wheeler Room is a large upstairs room which can be hired for functions. This room is licensed to hold marriage ceremonies for up to 175 guests. The room can hold 220 persons on round and oblong tables with a large dance area. The room is fully air conditioned.